Cutting to the chase, dusty white dwarf stars are a mystery. Astronomers have observed them for some time, and they are pretty obvious when the light from the white dwarf is analysed. Absorption lines in the white dwarf spectra show the presence of dust. Current theories suggest this dust is there after rocky debris (i.e. 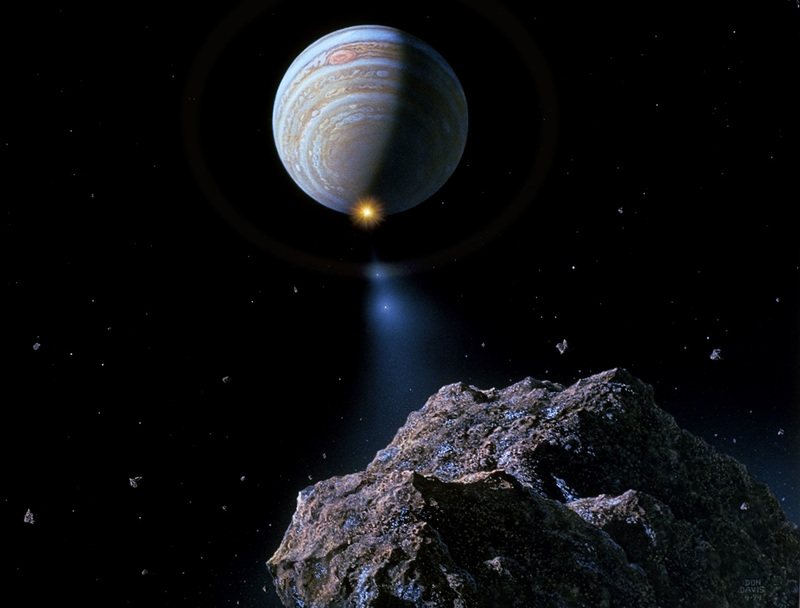 asteroids) fall too close to the white dwarf, and through tidal shear get shredded (like what happened when comet Shoemaker-Levy 9 strayed too close to Jupiter and got ripped apart by its gravity). The rock is then pulverized over millions of years and the dust eventually settles into the white dwarf. Sounds reasonable, but what mechanism(s) feeds the white dwarf with asteroids over long time-scales? This is where John Debes’ work is very insightful. In his model, Debes simulates an evolved Solar System. This means the Sun has run out of hydrogen in its core in 4-5 billion years time, puffed up into a huge, angry red giant (eating up all the inner planets, from Mercury to the Earth), and then ejected its plasma into space, forming a vast planetary nebula. What is left behind is a white dwarf where the Sun used to be and the outer planets are orbiting at an expanded distance from the Sun. Like now, Jupiter will still wield its gravitational dominance, influencing the gravity of the asteroid population continuing to orbit the dense white dwarf Sun. Using derived asteroid accretion rates from observations of dusty white dwarfs, Debes is currently working out whether his model can explain the mechanism behind dusty white dwarfs, and the possible mechanism that will make our Sun a future dusty white dwarf. Naturally, this is very exciting, as if Jupiter’s influence on the Solar System’s asteroids is enough to explain the observed accretion rates, could it mean that we are observing white dwarfs with massive Jupiter-like gas giants shepherding asteroids closer to the host white dwarf? Also, does this mean that we could be observing white dwarfs that give us a glimpse of what our Solar System may look like in a few billion years? Possibly. Fashionableand welcome everyone to come buy. Makes me wonder, how much energy would you need to drop Jupiter into the sun , could smacking a gas giant into a white dwarf re ignite it and how long could a Jupiter mas planet fuel a star? In our current healthcare system, PBMs are viewed as a cost-saving mechanism to deliver prescription medications to insureds under contracting health insurance plans. Let’s be clear: They are an invention of the major insurance companies, who separated themselves from pharmacy benefits in order to continue to realize profits on one http://www.chase.com of their largest profit centers while becoming non-profit corporations.In fact, PBMs create an additional layer of administrative costs while serving as a pathway to deny legitimate benefits to insureds while keeping the insurance companies’ involvement at arms-length. They are the unclothed emperor of the health insurance industry, but there are some who are calling them what they are. Just wondering if results of research include the possibility that as Sol expands, it’s gravitational density will also expand resulting in the closer planets moving away in ratio to that decreased density. In other words, as the Sun expands so will all the atoms that make up a large portion of the mass of the Sun. As they seperate further apart from one another, each atoms gravitational influence on the other will become less influental as a whole. So in effect, the gravity ‘field density’ will decrease causing the inward planets to drift away from the Sun in ratio to the expansion..